His world was characterized by violence, alcoholism, and abuse, but young Donnie McClurkin found a safe haven in his church, Bethel Gospel Tabernacle, Assemblies of God. It was there, at the age of nine, when he made a commitment to Christ. Throughout his troubled youth, amidst the strife of daily life, he learned to stand on the promises in the scripture. "A man's gift makes room for him, and brings him before great men." (Prov 18:16) "I have set before thee an open door, and no man can shut it" (Rev. 3:8). Donnie was born, and raised in Amityville, New York. Because of a God-given gift of music that ran in his family, Donnie formed the McClurkin Singers with his siblings, and a few close friends in 1979. It wasn't long after that when Donnie began to feel a calling to preach. He went on to meet gospel-legend Andrae Crouch, who became a mentor to him. Through that relationship, grew a friendship that would shape the entire course of Donnie's future. Donnie went on to form the New York Restoration Choir, who recorded the album I Feel Well in 1989. The song Speak to My Heart forged a strong following in the gospel community that continued to build the groups reputation. "God just got behind it, just like He got behind that rock David threw at Goliath!" Donnie, says, chuckling, "It's been nothing else but Him." In 1996, Donnie released his self-titled, debut project on Warner-Alliance Records. This album featured the hit song Stand, as well as a re-recorded Speak to My Heart, which garnered him two stellar awards, as well as Grammy , and Dove award nominations. Live in London and More was recorded in 1999 at the historic Fairfield Hall in Croydon, England. Released August 2001, the album quickly became a best seller with it's Dove award winning song We Fall Down and held the number one spot on all of the gospel charts. In six months time, it achieved gold status with 500,000 records sold and by nine months was platinum (1,000,000). This project, recorded on the Verity Label, has opened doors around the world including The U.K., and The Carribean. After being an associate Pastor to Marvin L. Winans for nearly a decade, Donnie became ordained and is Senor Pastor at Perfecting Faith, Located in Freeport, NY. In 2001, Donnie had his first book published by Pneuma Life Publishing. Eternal Victim/Eternal Victor reflects on Donnie's past and parallels his family circumstances with biblical families. "Victims and victors have one thing in common-suffering -it is how one handles those events that classifies whether they are one or the other," says McClurkin. In September of 2002, Donnie recorded his sophomore Verity album at West Angeles Church of God In Christ. Donnie McClurkin...Again, released March of 2003, has already captured critics and fans alike with the sure to-be-classic song "The Prayer" with Yolanda Adams. 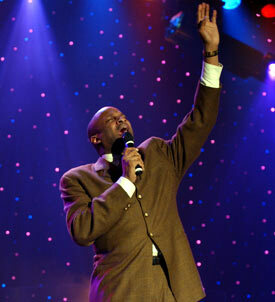 Donnie McClurkin feels his purpose in life is to worship God, and to minister to people. He frequently ministers at some of America's great gatherings such as Promise Keepers, Carlton Pearson's Azusa Conferences, Benny Hinn crusades, TD Jakes Ministry events, as well as Rod Parsley's Dominion Camp Meetings. Some interesting highlights of Donnie's ministry are performing at the White House before United States Presidents Bush, and Clinton. He has made appearances on The Oprah Winfrey Show, and has an award winning song on the soundtrack of the animated film, The Prince of Egypt. McClurkin's message is clear, as real today as the day he committed his life to Christ at nine years old: "I want to introduce Jesus Christ to the world, not as a religious leader, but as an intimate Friend who wants to radically change our lives,"he explains. "I want the world to know that we can sit down and embrace Him, He can embrace us, and He can handle any problem we are going through. He loves each of us individually, one by one."